My business partner and I have worked with SEG Funding and they have helped us obtain multiple loan products. We initially obtained a LOC to help with cash flow needs. Then we came back for a 2nd round of funding as we were growing and needed more capital. We were able to factor some of our receivables for a great rate and this has literally saved our business. Thanks for the great partnership guys! We approciate all the work put in to help us out.! I found SEG Funding online while I was searching for a Start Up Business Loan for a Franchise opportunity with SubZero Ice Cream. Prior to applying with SEG Funding, I had applied at a lot of banks on my own with no success. I was able to correct some of the problem areas that these banks had with my previous applications and obtained an SBA $105k loan with their help. Very Very Satisfied. They helped me roll over my 401k for my down payment to acquire an existing business. Once the lender saw I had money to put down, I was able to get a $361,000 SBA Loan. Their fees were very reasonable and were very professional. The team at SEG Funding was very helpful and supportive of our trucking business. Christian, specifically, was very informative in helping us through the process and make it as seamless as possible! I'm now onto my 4th truck and it's going great. Excellent Company! My experience was very good. They have the most efficient process and the SEG Funding staff are very professional. They seemed to care about the growth of my business and focus on long-term relationship. James was my account manager and knows his process better than anyone, in my opinion. Thank you James for your work on my behalf and I highly recommend SEG Funding to anyone. This is the second time I have used SEGFunding. First time I needed a lot of help with my entity, business plan and website. After their work I obtained $56,800 in business financing for my Cafe. I got into a new location and was able to obtain a very large commercial loan the next time. Yea for me! Sandy's Cafe – Sandra M.
Only got $87,000 of the $95,000 that I wanted, but I can do what I need with this start. Pretty satisfied since I can't do this alone. SEG Funding connects your small business with lenders and other funding sources nationwide in an efficient and transparent environment. No matter what stage of business you are in, we are here to help you Start, Expand and Grow your company with hundreds of debt products nationwide. We have arranged over $600 million in funding for our clients and process more than 50,000 applications a year! Small Business Loans - Helping Businesses Grow - Just Like Yours! We’ve funded more than $600 Million in capital to thousands of businesses nationwide. Whether you need a small business loan Start, Expand or Grow your operation, SEG Funding is here to help you know how much you can qualify for. Call Now 888-569-3865! Having an excellent credit score definitely gives you an edge when applying for a small business loan or traditional loan from a bank. Of course, the requirements depend on the individual lender along with business factors such as your revenue, cash flow and time in business. Do you have a credit score that is 'not so good'? If so, don't worry. The team at SEG Funding will look at it, but its not the only thing we consider. Even if you are a new startup business or have only been around for a little while, we have ways to get your business funded fast! We’ve helped small business owners get more than $600 million in loans and process more than 50,000 applications a year! We can help you get the cash you need! Fund your next step today! SEG Funding knows how to get small businesses funded and does not have any requirements to apply and start the process. However, each loan product does have different requirements based on the specific lender. Applying for a business loan with SEG Funding increases your ability to get approved significantly because we track which lenders require certain items. Time in Business: When seeking loans for your business, it is important to take the time to learn about each small business loan requirement. Some lenders may want to know that you have been in business for at least two to three years. Are you a New Business? Or Established business? If your enterprise is less than a year old with little revenue or a start-up business. 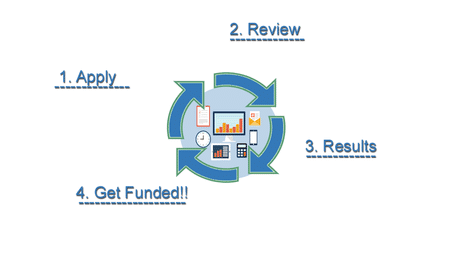 SEG funding can help you! We specialize in getting Startups or New Businesses the small business loans you need to pursue your dreams. Credit Score: FICO has defined a ‘Bad Credit’ Score as anything between the range of 300 to 629. This is a common reason that banks reject small-business loan applications. If your score falls below the banks minimum threshold, you may not qualify for one of the most attractive and lowest interest rates. However, SEG funding specializes in helping companies with Bad Credit to quickly change their Bad Credit to Good Credit… and then get you a small business loan with the most attractive & lowest interest rates. With or Without Collateral: Secured business loans are a common type of business financing. Whatever you choose to secure these business loans with, you're essentially promising your lender that you'll repay your loan. Startups can get business loans without collateral through the SBA. Technically, banks or lenders will not decline your business loan application, based on ‘having no collateral’ since the SBA will guarantee 75 percent of any loss on the loan to the lender. If you're wondering how to get a small business loan without collateral, the answer is to work with a company, such as SEG Funding, that knows which loan products that do not require collateral. Small business loans for various industries: Small business loans customized for specific industries and types of businesses are easier for certain industries than others. There are several industry-specific loans available to small business owners, that are not as widely known compared to others. SEG Funding has tons of experience in setting up these types of loans based on ‘business type’. SEG Funding is dedicated to supporting entrepreneurs and small business owners with the loan products that make the most sense. Take advantage of SEG funding opportunities so your small business can succeed. Apply today with confidence! Or give us a call at 888-569-3865. Some banks/lenders look for excellent credit, extensive financial history and collateral. As a result, many startup businesses seeking loans may get rejected consistently simply because they do not meet the necessary requirements that are imposed by these traditional financial institutions. With SEG Funding, however, we have successfully gotten tens of thousands of clients approved. We know the best ways to get your loan approved and cash in your hands, based on your particular situation in the quickest and easiest way possible. Let us help you get where you want to go! This is why it is to your advantage to work with SEG Funding. We know how to navigate the complicated lending process and get you the business loan that you need with the best terms possible for your situation. SEG funding, which is based in Utah, provides nationwide business loan services in all 50 states. Get Small business loans online with funding amounts from $5,000 to $500,000. We make it easy to apply & qualify for the business loans you need. Just click to apply now or give us a call at 888-569-3865.